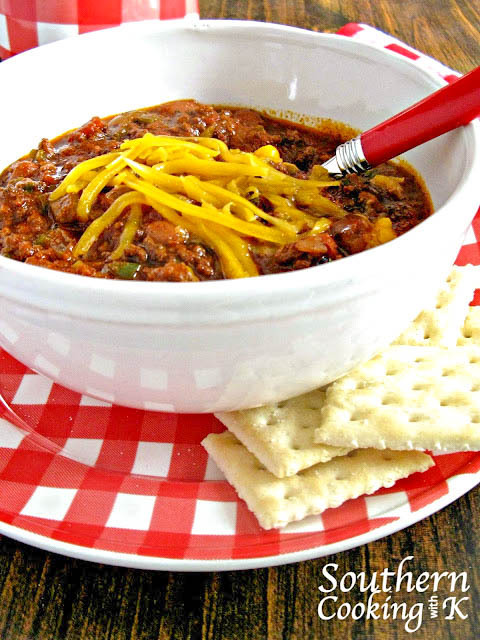 Crockpot Chili, slow cook chili with flavorful browned ground beef, beans, tomatoes, spicy seasonings, and a secret ingredient. The perfect meal to make ahead during the week. It has won 4 chili cook-offs. Save any leftovers and serve it over chili dogs, Frito pies and chili cornbread! The possibilities are endless! With the announcement of a Chili Cook-off at our church, I knew I had to enter my recipe for chili. I created this recipe a few years back. The flavors are amazing, but I want the flavors to bounce right into a win, so I added a little secret ingredient, canned jalapeno juice. It did the trick--oh! my. Going into the contest, it was just 8-Hour Chili, and coming out of the contest, it became Blue Ribbon 8-Hour Chili. To my delight, I won first place overall. 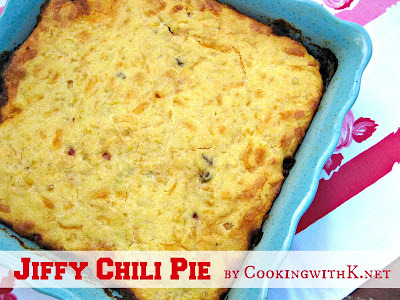 Since then this recipe has won 4 chili cook-offs. In a large skillet, brown ground beef with salt and pepper. Transfer browned meat to a large Crock Pot. Add remaining ingredients in the order as listed. Stir until mixed well. Cook in a crockpot on low for 8 hours or 4 hours on high. (See note below) Stirring occasionally. Serves 10-12. 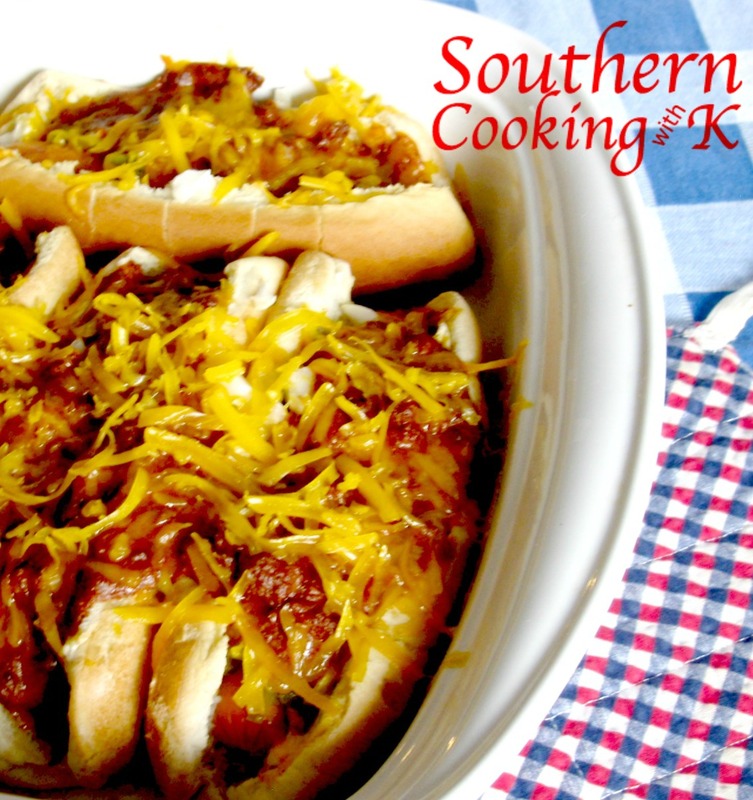 Note: I cook the chili on low in my new crockpot since I posted this recipe. It seems the newer ones cook hotter than the old ones. 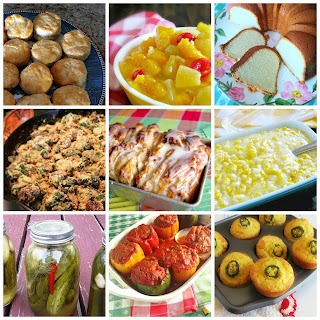 One of my goals for the year is to expand my list of crock pot recipes..thanks SO MUCH for getting me off to an awesome start! You sure do have some Blue Ribbon Chili here. It looks delicious and we will just love trying it out. I am so excited that you entered it in The Texas Star Chili Cook Off 2011. 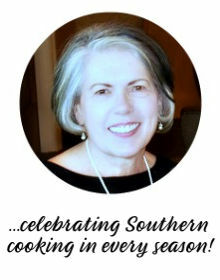 Thank you so much for your entry and good luck with the Cook Off! Your chili recipe sounds good, I love jalapenos! Your Award Winning 8 Hour Chili looks like a delicious bowl of chili and I can't wait to taste it. Thank you so much for sharing it with The Texas Star Chili Cook Off and the best of luck to you! Made your chili a few days ago but without the jalapenos 'cause my hubby is a baby (lol!). Best recipe I've found yet!!! We used Wick Fowlers packages for years, but I knew there had to be something better. This is definitely Blue Ribbon worthy! 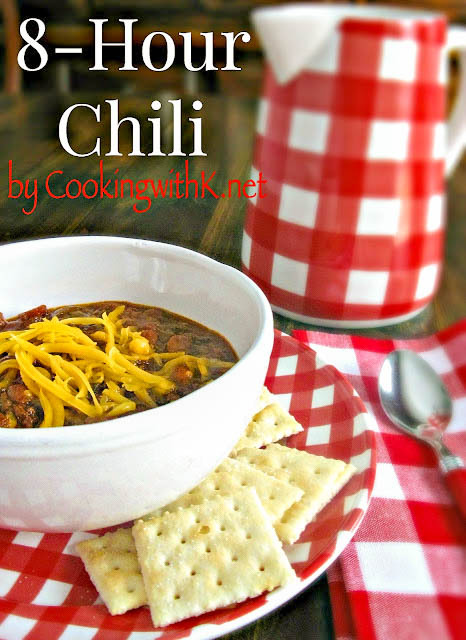 Pam ~ I am so happy you stopped by to let me know how much you enjoyed the chili recipe...welcome to CWK! This sounds wonderful and we make chili at least once a month. I'll have to give yours a try, but not sure I can get the Williams Seasoning packet. Can I sub with something else or does it make the recipe? This really is blue ribbon. I just won a cook off at work with the recipe. It did come out a little soupy, but the flavor was on point! Thank You Cooking with K!! How spicy is this? Could kids eat it? Looks delish! If you are making for kids, I would leave out the jalapeno juice. And you may want to back off on the minced jalapenos too. Just make it with one or two jalapenos first and see. Hope this helps. It really is the best chili recipe. 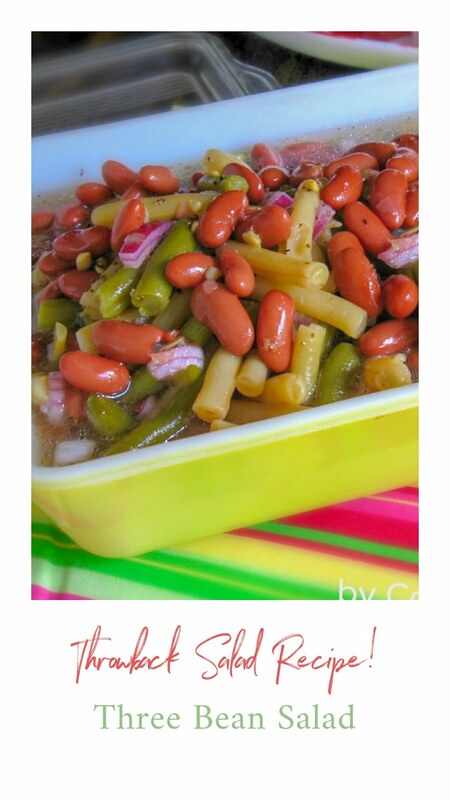 Great recipe, Kay! And congrats on your wins! BTW the reason your new crockpot is cooking hotter is because some of the older ones weren't getting hot enough to kill the bacteria fast enough, and people were getting sick. It's a real pain, though, because "slow cookers" are supposed to cook SLOWLY!! I have discovered that using the slow cooker function on my Instant Pot helps keeps food from burning as much, but that's because the IP only has a heating element on the bottom, and slow cookers have heat all around the sides. Anyway, something to take into consideration :-) You're making me hungry for chili! That makes sense they were not hot enough. You would have to cook something all day or night. I had to get use to the new ones cooking hotter, but I do like that they don't take as long. I see recipes that say cook two hours in the crockpot and I think why use crockpot. haha! I need to get on the IP wagon. I'm still deciding on which one to buy. I go back and forth...Air Fryer or Instant Pot. And then where do I store all of them.